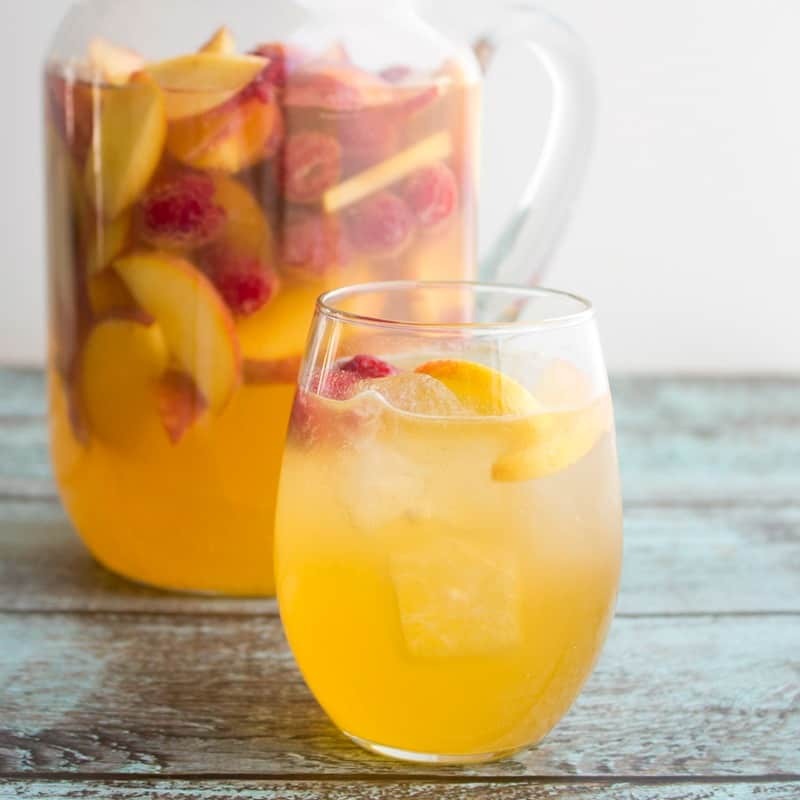 Bring on summer and a never ending pitcher of this Peach & Raspberry Moscato Punch! It’s crazy good and made for sipping poolside! Sangrias and punches are quickly becoming my favorite summertime cocktail. They’re easy to whip up, the colors are gorgeous, and they taste awesome. This punch is no exception. The fresh peaches and raspberries are so pretty in this cocktail and it goes down so easily. Like almost too easy. Like, “Hey! Where did all the punch go?” easy. There’s no right or wrong Moscato wine to pick for this punch. We had a passion fruit flavored (totally sweet) Moscato at the house so I used that, but any Moscato you like will work just fine. **Update: I made this punch again with a less sweet moscato and actually liked it better. For the vodka, you want to make sure you pay attention to the ABV (alcohol by volume) on the bottle. I used Alize Peach for my punch, and that has an ABV of 16% (32 proof) so I used 1 cup of the vodka. If you’re using a higher ABV vodka like Absolut Peach which is 40% (80 proof), you’ll only need about 1/2 cup. Of course, you can always add more of less of the vodka to your taste, but be careful! This punch is dangerous. 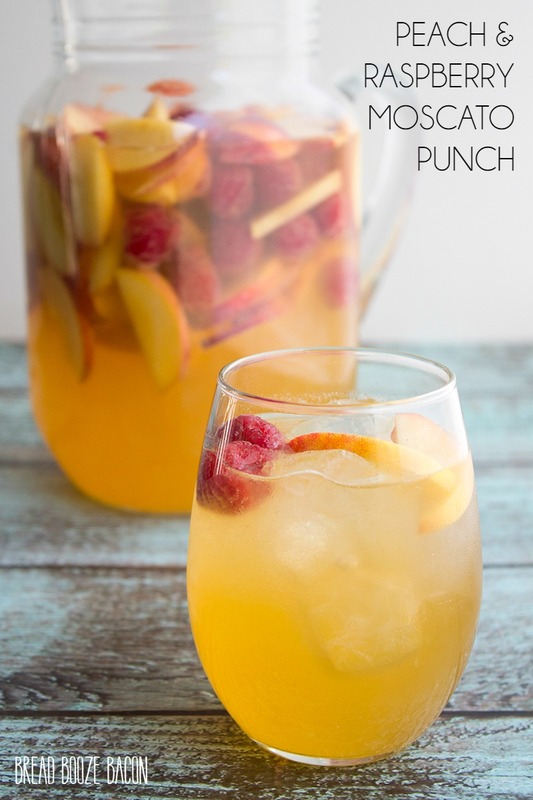 Bring on summer and a never ending pitcher of this Peach & Raspberry Moscato Punch! It's crazy good and made for sipping poolside! Cut the peach halves into thin slices. 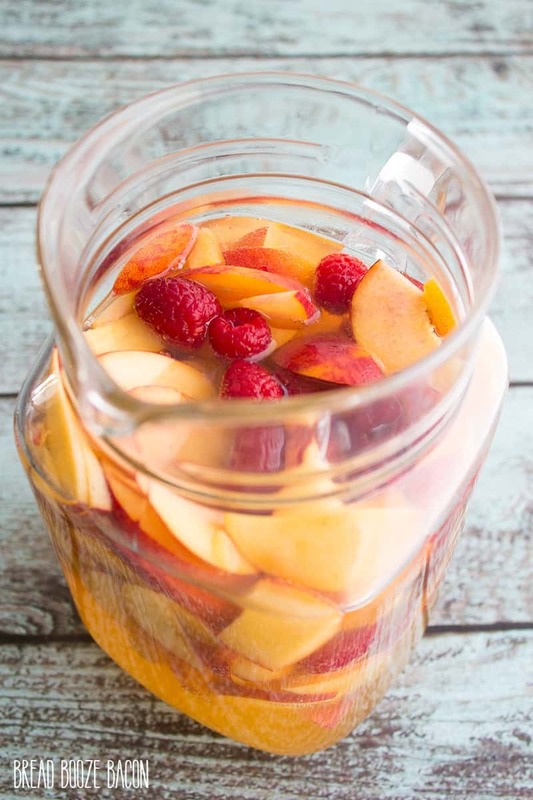 Place the peach slices in the bottom of a 2.5-quart pitcher, and then top with the raspberries. 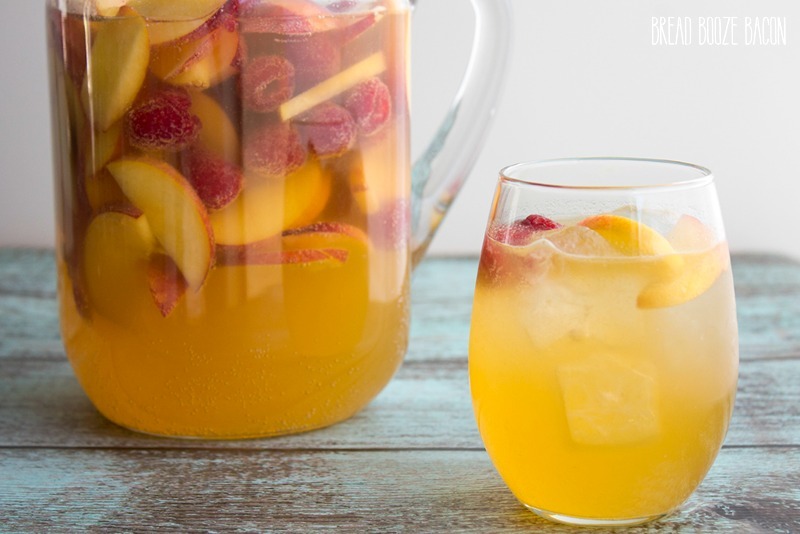 Pour in the Moscato, soda, peach nectar, and vodka and give the punch a stir. Fill a wine glass or rocks glass with ice and fill with the punch, being sure to get some of the fruit into the glass as well. For the lemon-lime soda, add 1 cup to the pitcher with the other liquid ingredients. If there is still room, add more soda. If not, you can float a little soda on top of each glass ounce you pour the punch. If peaches & raspberries are not in season, you can substitute a package of frozen fruit instead. If you want to go with an 80 proof vodka, reduce the liquor measurement to 1/2 cup. You can add more if you like, but taste test first.